With the school holidays upon us, keeping the kids happy is more important than ever. This summer, Italian restaurant group Carluccio’s is caring for the little ones and their parents by offering Kids Eat for £1 when ordering an adult main course. Running from 25th July to 31st August, children can order a main dish, dessert and soft drink, all for just £1, between 9am and 5pm at any participating Carluccio’s branch. The menu features a choice of classic Italian family favourites including lasagne, creamy macaroni cheese, deliciously moreish lemon ravioli filled with ricotta and pine nuts, and chicken Milanese served with rosemary roasted potatoes. Little ones can also create their own pasta dish with either Spaghetti or Ditaloni, and one of Carluccio’s tomato, pesto, or bolognaise sauces made with the finest Italian produce. To finish, bambinos can choose a Carluccio’s ice cream or fruit sorbet whilst being entertained by the activity pack provided. While the young ones have their meal, why not enjoy a dish from Carluccio’s new summer menu which features regional Italian favourites. July specials include refreshing chilled cucumber soup, Sicilian swordfish muddica and seafood risotto; a true taste of the Mediterranean with calamari, clams, mussels and prawns. 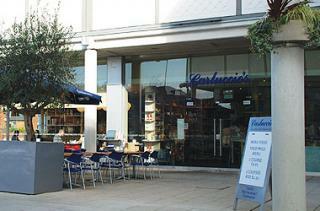 Whether you’re a hungry child or an even hungrier parent, there’s something for the whole family at Carluccio’s.